Bestselling author and Santa Barbara native, T.C. 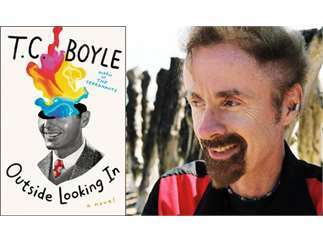 Boyle returns to Parallel Stories to read from his new novel exploring the first scientific and recreational forays into LSD and its mind-altering possibilities. "Outside Looking In" deals with the early years of LSD, from its first synthesis by Albert Hofmann in 1943, to the time when it broke free of strictly psychiatric use and set society afire in the Harvard-based experimentation of the 1960s. Boyle could not be more timely, as he examines through his fiction what it might mean now that psychedelic drugs are once again being used clinically. And, yes, says the author, "Dr. Leary does appear as a subsidiary character in this one, just as Dr. Kinsey appeared in my novel The Inner Circle and Dr. Kellogg in The Road to Wellville." Join SBMA for an utterly engaging and occasionally trippy look at the nature of reality, identity, and consciousness through the idiosyncratic and always entertaining lens of T.C. Boyle.